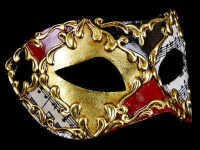 Craquele Luxury Masquerade Ball Mask Silver is painted in antique white/silver and adorned with ornate Venetian designs. 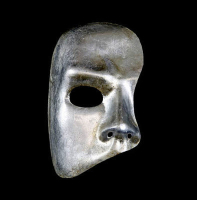 This simply stunning Craquele Luxury Masquerade Ball Mask - Silver is painted in antique Craquelè white/silver and adorned with ornate designs. Added faux diamond crystals will bring a rich highlight to any party you may attend. 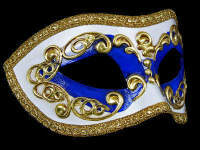 An extravagantly designed and handcrafted Venetian mask. Fastening: It secures with black ribbon ties so ensure a nice secure fit.